Can't decide on a material for your fireplace surround? If you're sick of what's there now (or you're building a fireplace from scratch), changing out the surround can create a whole new look for the room. Fireplaces, after all, are designed to be attractive focal points. Colorful tiles, such as the ones shown here, can be laid in any sort of pattern or image. The only limiting factor is your creativity. The only consideration you may want to make is whether you're living in your forever house or if you plan to sell it and move eventually. Your tastes may differ from the next person's when it comes to artistic fireplace surrounds, and something too exotic may drive away potential buyers. However, if this isn't a consideration, and you can do whatever you like, a mosaic image or pattern can be a great way to set a mood and display some of your personality. The fireplace surround here is from the gallery of Susan Jablon Mosaics. This the "Executive Preson" stone fireplace from Mission Stone. 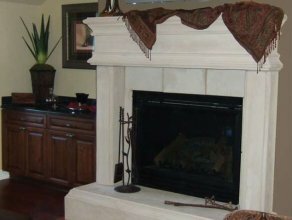 The company specializes in rustic limestone mantels and surrounds in a variety of styles, colors, and sizes. You can choose one of their existing designs or you can get custom ones done to your specifications. They have a large gallery that showcases their work, and if you're looking for stone fireplace ideas, that would be a good spot to browse. While a limestone fireplace can be sleek and modern, you might be looking for something a little rustic. 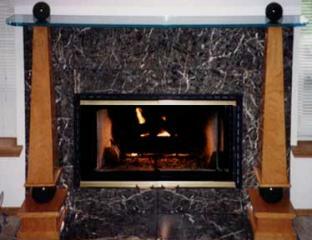 This second picture is of a custom designed fieldstone fireplace. 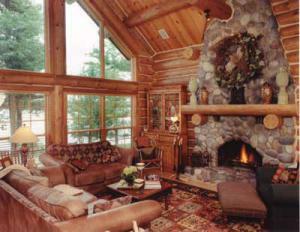 As you can see, this one fits in perfectly to the living area in a log home. Whether you're building your walls out of log or not, fieldstone can be great for giving that rustic "lodge" feel. Think of sitting by the crackling fire after a long day on the ski slopes. This fireplace was done by Young Construction Company (which actually did the whole home it looks like). They don't have as many pictures of fireplaces on their site, but you can see a lot more examples of fieldstone fireplaces if you head to Google and type "fieldstone fireplace" into the search field. Instead of just searching the usual results, click over the to "images" results. 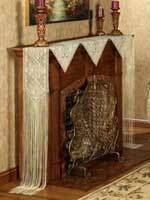 From there you can browse all sorts of fireplace pictures, and if you want to know more about the website where the picture is from, just click on it and there is usually a way to navigate to the site's home page. Let's take a look at one last style of stone fireplace. 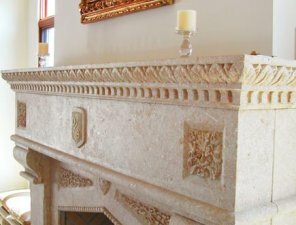 The "Deco Marble Fireplace" uses marble tiles with a glass mantle and wood highlights for a unique Art Deco inspired look. I'm always drawn to the clean, sharp lines of marble tile fireplaces. This one was custom done by Acappella Design and was inspired by "a table lamp and some trendy new furniture recently purchased by the owner." So if you're looking for fireplace ideas, the answer might already rest in your living room. What kind of furniture do you have that you love? Anything can be the inspiration for a design. Also, as you see, a stone fireplace can come in many different styles, and many companies will work with you to create custom pieces that perfectly suit your tastes. As I mentioned you can use Google Images to browse for a "stone fireplace" or any other kind of surround/mantel you're thinking about. It's a great way to get some ideas! 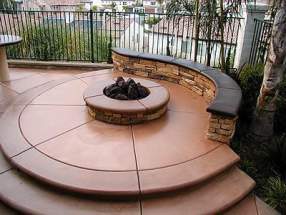 There are lots of portable firepits on the market, but if you prefer a permanent structure that will add value to your home, you may want to have a firepit custom designed and built. There are quite a few materials you can use, such as brick and concrete. Concrete is fun because it can be molded into so many shapes. It can also be stained different colors or etched with designs. If you've got a drab fireplace surround and you really want to perk it up (or you're just looking for a DIY project for the weekend), then you might consider covering it with glass mosaic tiles. This will work if your surround is currently made of a flat material, such as concrete. Whether you have a traditional wood-burning fireplace or a gas insert, you can add a lot of style and drama to your living room with a custom-designed and built mantel and/or surround. It doesn't matter if you want a huge, grandiose piece that wouldn't look out of place in a castle or something small, cozy, and modest--you can always get just what you want if you're willing to pay to have it custom-built. The downside is that custom work obviously costs more, but companies that specialize in working with wood or stone can give you just what you see in your mind's eye. This way your fireplace can be a deserving focal point for the room. Cantera Especial did the handsome fireplace surround pictured here, and they have a gallery of examples you can browse through for ideas. Some of today's fireplaces, especially in condos, are built into the walls without any sort of surround and sometimes not even a mantel. An easy way to dress things up and create a more impressive focal point is to add a mantel shelf and create a surround. Tile is a popular choice for surrounds, especially if you're going for a clean, modern look. Granite and marble are among the most frequently chosen tiles, but those aren't your only options. You can also opt for ceramic or slate. These slate pieces here would make nice centerpieces above the firebox in a field of similarly colored slate. 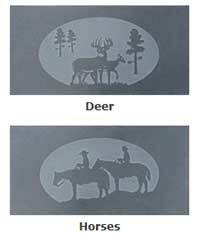 Available from the Harman Stove Company, the slate tiles feature deer and cowboys on horses, but you can also get flowers or a lighthouse, if you'd like to go with something more feminine (or at least less rustic). Decorate Your Fireplace with a "Mantel Scarf"
Anyway, the "scarf" is specifically designed to drape your mantel, and it will cost you about $35 if you order one online. You can get ivory or gold lace from Touch of Class, but if you know someone with sewing skills, they might be able to make you a custom mantel scarf. Now that summer is on the way out, it's time to start thinking of these things (and of course fireplace decorations are good all year around). Indoor fireplaces aren't used as much in the summer when hot weather keeps the home warm, so what do you do with your fireplace in the down time? Whether you use it or not, a fireplace remains a focal point in the room. People's eyes are drawn to it when they come in, so you probably don't want to leave it a big sooty mess. Clean that sucker out, vacuuming ashes and remains from last season's fires. Also, summer is a good time to have your chimney swept. Tie a bundle of twigs together to look like logs (only more deocrative) and stack them in the firebox. Stack 3-D Mexican tin stars; their silver color reflects light interestingly. Put a fireplace candelabra in the firebox (remember to open the flue if you actually light the candles). Arrange a stack of birch logs (their white color and textured bark makes them attractive) to look like a fire is about to be lit. A crackling fire in the fireplace can be a lot of fun on a cool evening, but let's face it: most of us who have wood-burning fireplaces don't actually light a fire all that often. That means most of the time our fireplaces are just dark voids in the living room. Perhaps because of that, more and more people are sticking candles in their fireplaces. Today you can even get special "fireplace candleholders" that are designed to fit nicely into your firebox. This candleholder from Bellacor can hold up to ten candles and costs about $140 (candles not included). It's not quite the same as having a genuine fire crackling in the fireplace, but hey, candles are a lot easier to light and a lot easier to put out. So, if you're just looking for a way to add some light to that void in your room, check out them out. Take a cup of a water-based wall color (vanilla, beige, etc. ), then dilute it with water, so it's the consistency of skim milk. Wash the bricks with plain water to clean them first. Dip, then wring out slightly a marine sponge into the mixture, and rub it onto the brick and mortar. Because brick is porous, it'll soak the mixture up, so don't use a lot at first. You can always go back over it to reach the desired lightness. When you reach the chimney, work in a diagonal line. Save the hearth until last, so it's easy to wipe up any drips.